Oils degrade naturally over time and an olive oil past its prime will lose healthy antioxidants and eventually become rancid. The most important thing you can do to prevent this is store your olive oil right. Most olive oils that are stored properly in the original sealed packaging will keep for 1 ½ to 2 years, and once you open the bottle you should use the oil within a few months. Light, especially direct sunlight or fluorescent lights, also speeds the degradation of the oil. Tempting as it is to display a pretty bottle in the window, don’t do it! Increased exposure to air causes the oil’s antioxidants to deplete. This is why you should use up open bottles - every time you pour out some oil, it leaves more air in the bottle. For the same reason, don’t make a vent hole in the top of tins –while it might be easier to pour, if you can’t re-seal it the oil will now be in constant contact with air – a big no-no. The same goes for pour spouts with no cover – you want to be able to cap or seal your bottle after each use. Finally, people often ask about refrigerating olive oil. If the oil is exposed to extreme cold during shipping or storage, it should still be good once it returns to room temperature. However, some research suggests that repeated heating and cooling – such as storing it in the fridge in between uses – puts a lot of stress on the oil and doesn’t necessarily extend the shelf life. 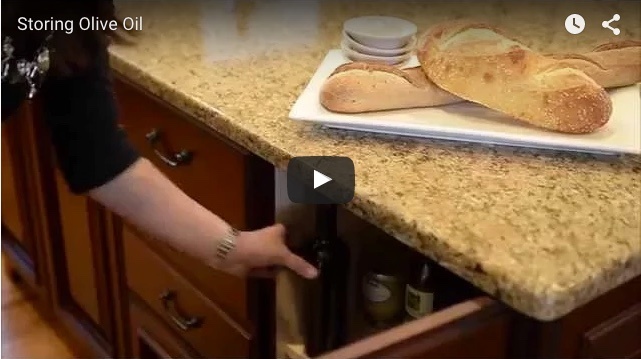 Storing your olive oil in a cool dark cupboard or pantry is the way to go!